Weather: 13 - 14°C grey & cloudy. The meadow down at the farm complex, in year two it is already full of wildflowers - Leucanthemum vulgare, red & white clover, Centauria nigra (Knapweed) and lots more. There was a meadow study day with Fergus today. 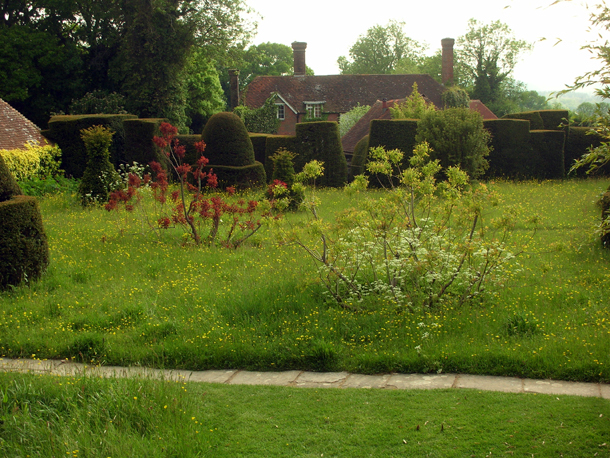 There are many different types of meadows at Dixter. 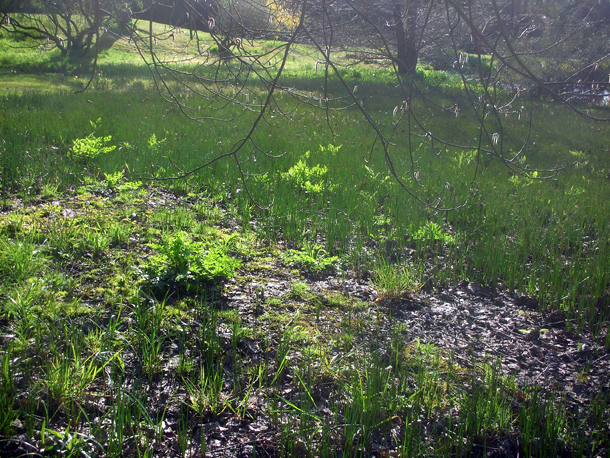 The one next to the horse pond is made up of juncus sedge grass. The big orchard meadow opposite the long border was ploughed land in medieval times, so has a long heritage. We have new ones in the making 2 - 3 years old, the one down at the farm complex is already impressive even though it is so young, helped by our own rich seed source (see Strewing). Our topiary lawn was basically what the lawn turned into when it was let go. Meadows are a complicated topic. It's not so much hard but there are a lot of questions that you have to consider when creating one - what you want it for, how you want to use it, what you want to get out of it, and what factors are you affected by. It can also get very scientific, there are formulas for seed mixes and schedules for cutting times. Topiary lawn in April full of tall meadow buttercups (Ranunculus acris) with the two cotinus (Smoke Bush). Underneath the green cotinus are Cow Parsley (Anthriscus sylvestris). Meadow by the horsepond just coming up in March - April. The light is shining through Water Dropwort - Oenanthe crocata (which is very poisonous). 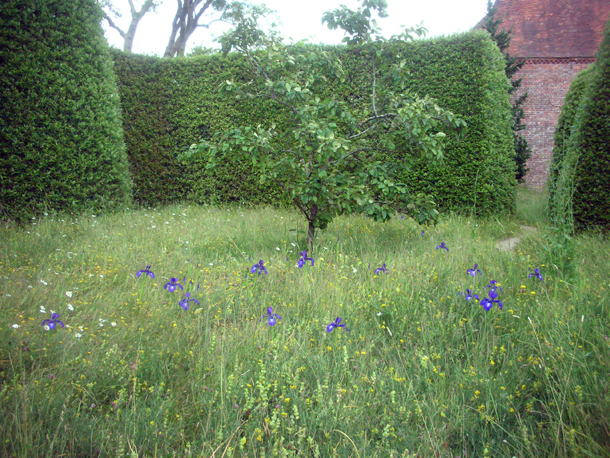 This quiet meadow in between spaces it began with Fritillarias & Erythronium descanis, then Iris latifolia (originally from the Pyrenees but has seemed to naturalise here), and now in July there are chicory Cichorium intybus. The tree in the middle is a quince. Fergus distinguished the difference between a cornfield and a meadow, which people often get mixed up with. The former is usually of colourful plants but they are all annuals & have many 'nursing' plants like poppies that makes it look good for the first one or two years, but does not last. The soil requirements for each are different. A meadow with longevity takes time & patience. It's good to think about the type of seeds that you want to use. Fergus is strongly for local provenance seeds usually obtainable from the local Wildlife Trust, but is not adverse to 'exotic' elements like the crocus, fritillarias & daffodil bulbs. When one looks at our meadows especially the ones at the front of the house and the orchard meadow, the way the bulbs comes up in a drift, one can see a likeness to some of the prints in the 'Wild Garden' by William Robinson - the grandad of naturalistic planting. Daisy Lloyd - Christopher Lloyd's mother, was very influenced by him and studied his work. She was the one who was particularly keen on starting and developing the meadows, which Christopher expanded upon in later years. 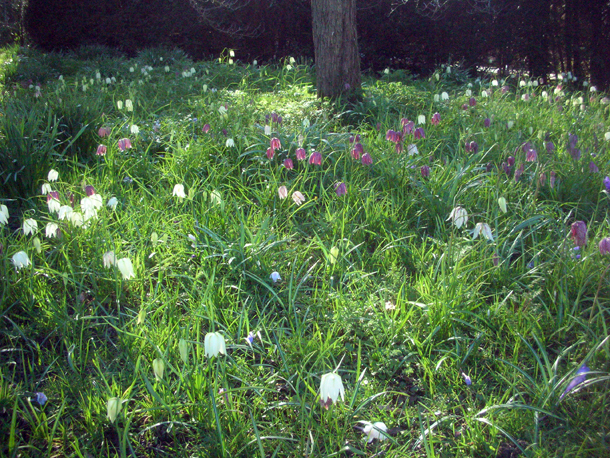 Fritillarias coming up in drifts in the orchard meadow in April - Daisy Lloyd planted many of the original ones. 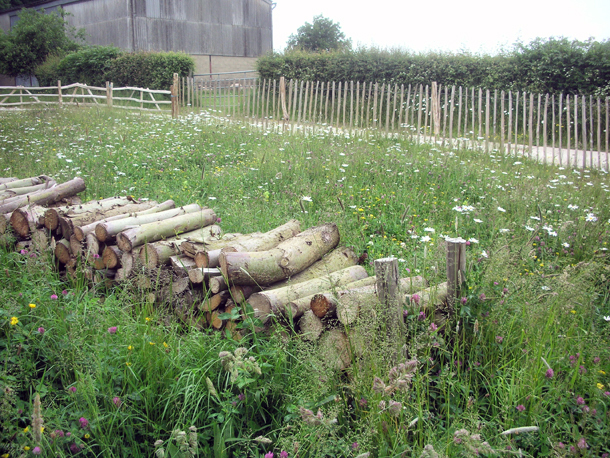 Some of the most important elements of setting up a meadow is starting from the right type of ground, to ensure that there are no weeds like dock & creeping thistles, and the less nutrition it has the more diverse the wild flowers will be. Cutting is another important element in meadow management, when & how its done. At Dixter we cut our meadows twice - once when the orchids have dropped their seeds which is usually in late summer (end of August) and then again around November to make sure that the grass is short enough for crocus bulbs to come up well. Orchid pollens are in the air and will always drift in if the ground is right. 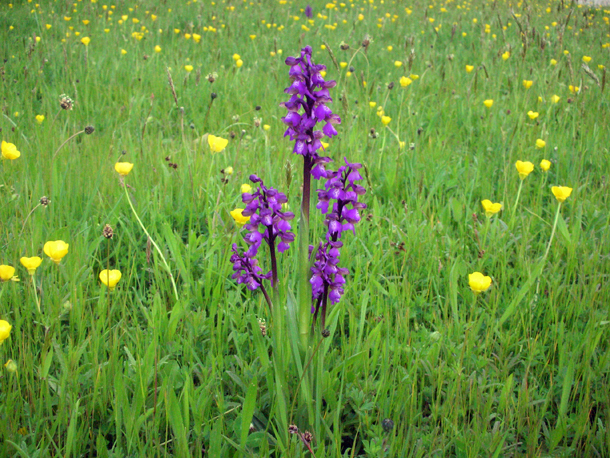 Orchids are not the end all of meadows, but if they show up, then it is a good indication that your ground is good. The green winged orchid - Anaphalis morio, before these there is also another dark purple orchid called Orchis mascula (Early Purple orchid). 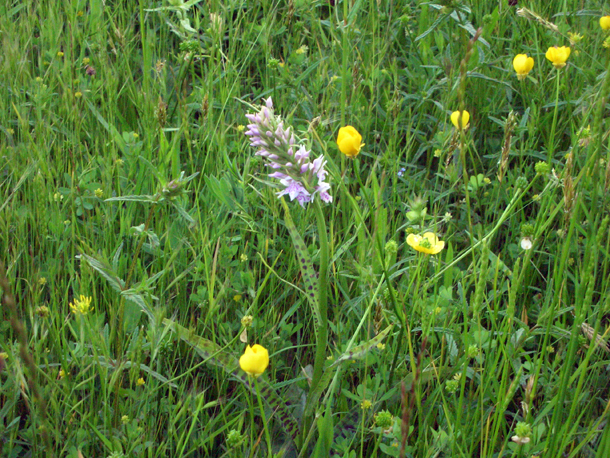 The common spotted orchid Dactylorhiza fuchsii. These came in particularly noticeable drifts and swathes this year. Some were even freakishly big, as well as a couple of curious albino ones. 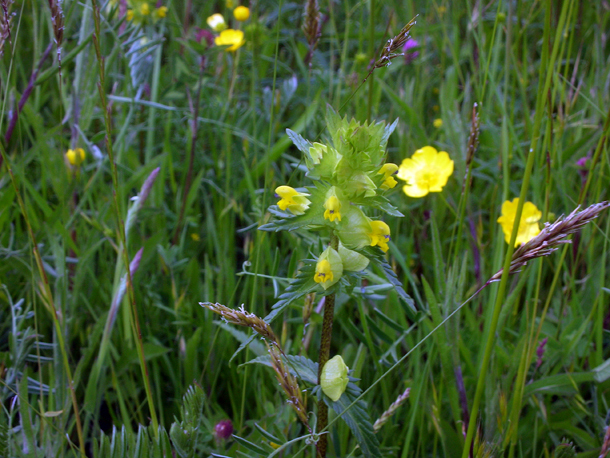 A significant meadow plant is yellowrattle - Rhinanthus minor which I wrote about about last year (click here to see post). 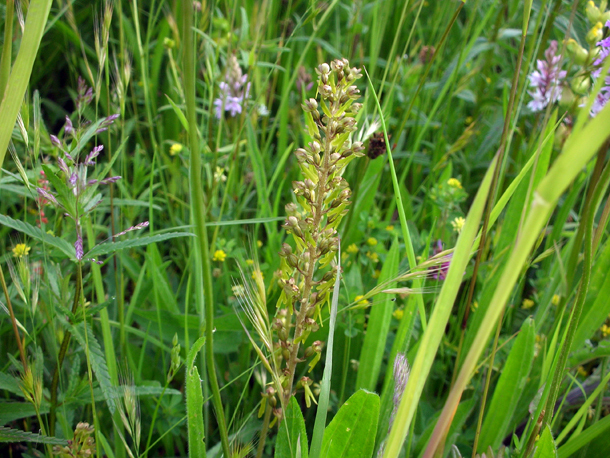 These semi-parasitic plants helps keep the grass low so that more diverse plants can grow. Rhinanthus minor - Yellow Rattle. Then there is the wider picture to consider - is it purely for aesthetics, or is it for conservation & supporting biodiversity. Or is it part of a bigger system like a farming rotation and be used as pasture land, which is a more holistic approach to horticulture & agriculture and how things used to be done. Much of this has been lost and hence the threat of meadow land also. They are great habitats for wildlife - gnapweed, hawkbit & dandelions are perfect for honeybees, more different butterflies have been found in the meadows because some of them like to lay their eggs on the tall grasses. This is why we only cut our meadows with a slower machine that cuts like a scythe and only in sections at a time, so it gives a chance for the wildlife to move onto somewhere else. Fergus is hoping to eventually just to use hand scythes to cut the meadows. 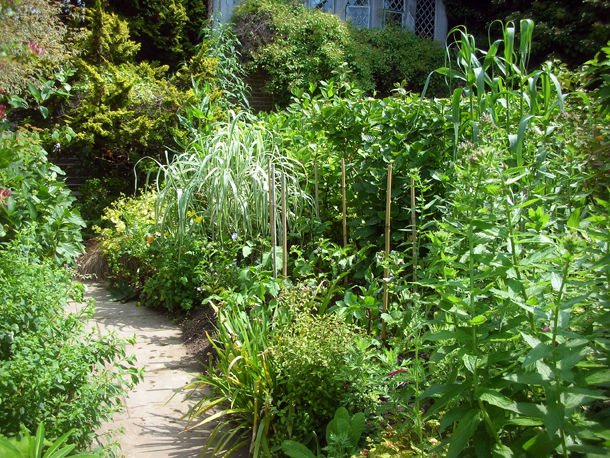 This has spurred Dixter to hold a scything competition at the end of this summer. Assisted Leo with one of the pots display on the circular step. Fergus is wanting us to take it in turn to take the creative initiative and lead how it is done, so it was Leo's turn to guide it. Brushed up paths and potted up Allium senescen subsp. montanum. 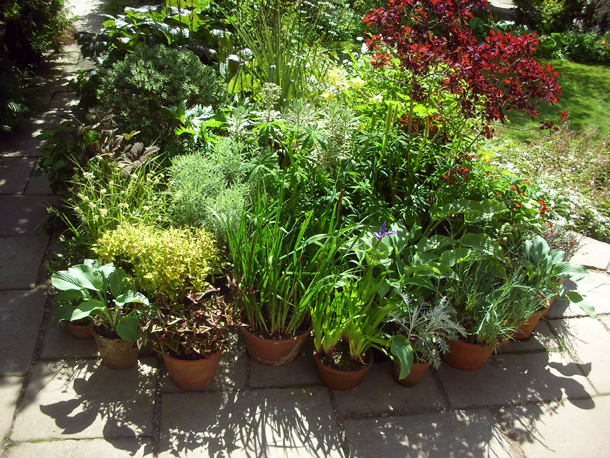 We are helping the nursery at the moment to close the gap there, before we start doing more planting in the garden. Things are always having to flexibly change according to circumstances, it is never guaranteed that it will stay the same. Weather: 15-16°C, sunny but windy. Potted up Aster x frikartii 'Mönch' as stock for the nursery from our own cuttings. I gave a tour of the house & gardens to my former college teacher and her current students. It was great to show students contemplating their next steps what they could do and sharing with them how passionate & inspired I have felt being here. Planted out dahlias in the high garden in the main stock bed. We put in 'Gloire de Heemstede' next to Agastache Black Adder as a more unusual combination and Dahlia Dove Grove on another side to give some red to the scene. Dahlias were staked and watered in well. Weather: Around 14°C, the wind made it feel cold in the morning but it was distinctively hotter late in the afternoon. Setting up a hose & sprinkler system to water one side of the main stock bed in the High Garden before visitors came, and brushed up path areas there. I did some cuttings of Dahlia Dove Grove and transferred smaller ones into bigger pots. Then I moved them all into a hotter frame in front of the shop, to see if we can bring them on more as they're a bit weak. I did my first tour for 18 people from the North of Switzerland, they were just generally interested in gardens and had been touring a few already so just wanted a brief one, which made it easy enough. They were pleased that a gardener was taking them around so that someone could actually answer their plant related questions. Weather: 13 - 16°C. Very windy! Nursery duties (read here to see for what nursery duties usually consist of; a lot more watering replaces stoking fires later in the year). Weather: Apparently around 14 - 15°C today, cooler in the mornings & evenings. Bitty. Drizzle & heavy rain. 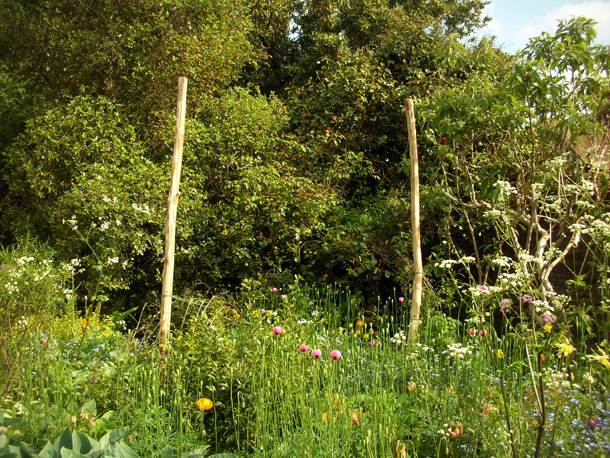 I staked some Ammi majus, with canes a foot higher than the plant to anticipate their future growth. Then I tried to make an Aconitum looked untouched and staked those with some tricky manoeuvres. Ammi majus all grown up a few weeks after staking with Papaver somniferum 'Danish Flag'. Not a poppy I necessary like on its own, but made a striking combination with the ammi. 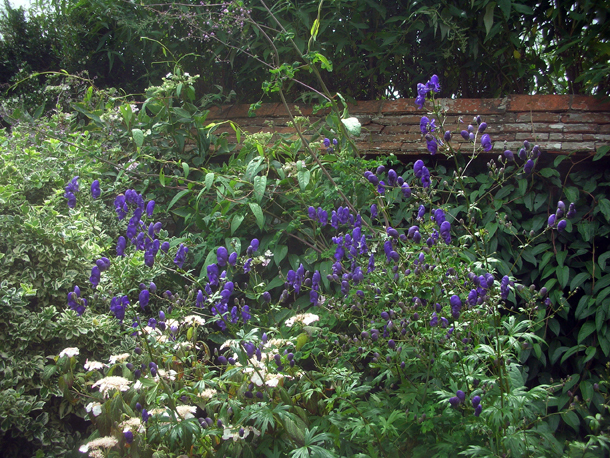 The aconitum now (July). 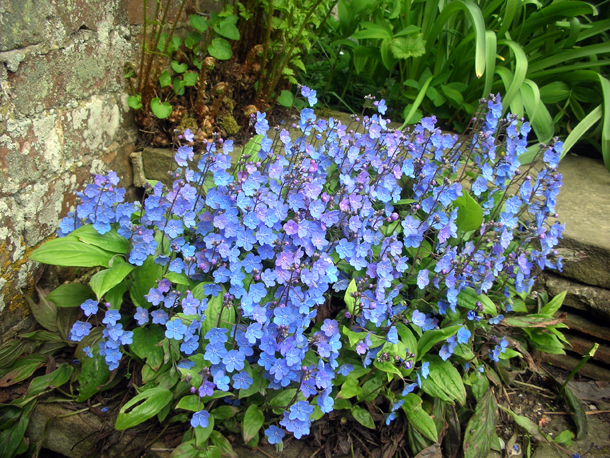 Two of the types we use are 'Spark's Variety' & carmichaelii 'Kelmscott' (Arendsii Group), both very blue. This one is 'Spark's Variety'. I went round malleting in hurdles that Fergus had laid out. Sometimes putting them at an angle to make them look as 'natural' as possible - for the plants to not be too hemmed in anyway. 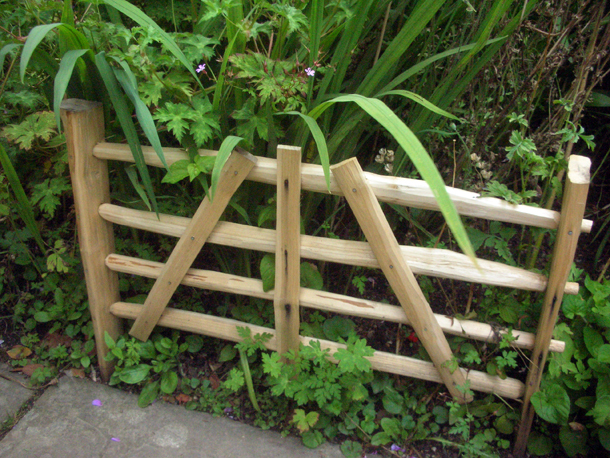 Hurdle made by Simon, woodworker apprentice for Dixter, he makes them for the garden and for sale at the shop/ upon request. Weather: Apparently going up to 18/19 even 20°C. A view from behind the border. I staked Hesperis matronalis now that the weather was better and it is suitable for getting into the beds more - these have been helping to provide colour much of May. We have alot of purple ones and a few white ones, the purple as an isolated colour is not something I thought I would like, but in Hesperis enmasse it seems to shimmer and glow. I shaved two chestnut poles and hammered them into the ground as support for a clematis. We decided that it was too much, so we took one out. The borders are definitely getting harder to get into as they are so full now. 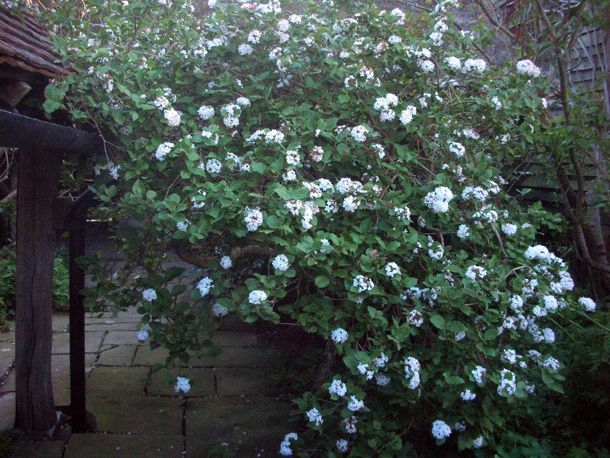 This sweetly scented Viburnum carlesii was in flower in April and was planted by Christopher Lloyd when he was a child. To read his letter of this account click here. This striking Omphalodes cappadocica 'Cherry Ingram' in the perfect shelter & shadow of the steps derived a lot of cooing from visitors as they walked by. This was a great combination before these extra prickly dead cardoons Cynara cardunculus (dwarf Chelsea Physic Form) were cut down. 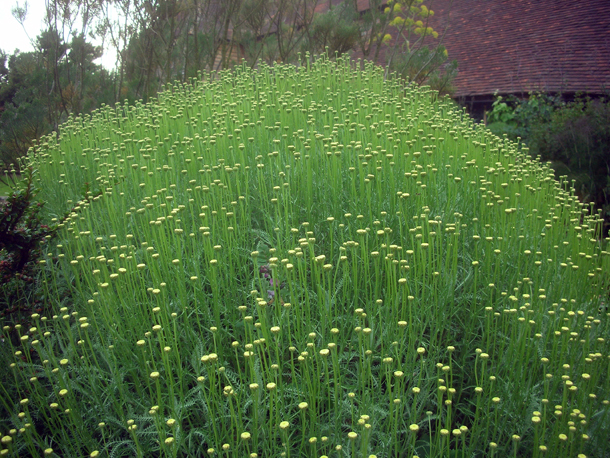 Santolina pinnata subsp. neopolitana looking good before it gets split by the wind and its own weight. 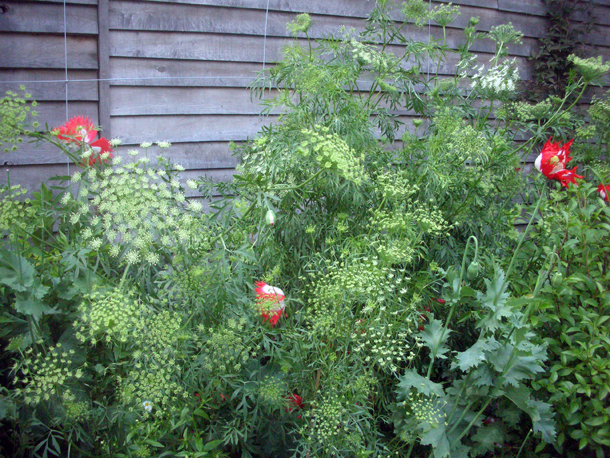 Cestrum fasciculatum next to the Ammi Majus. In front of this, unfortunately not in view in this photo was Ligusticum scoticum another white umbellifer aka Scottish Lovage. There was also the 'giant' giant fennel - Ferula communis, who made a fine display from February and is only going over now. 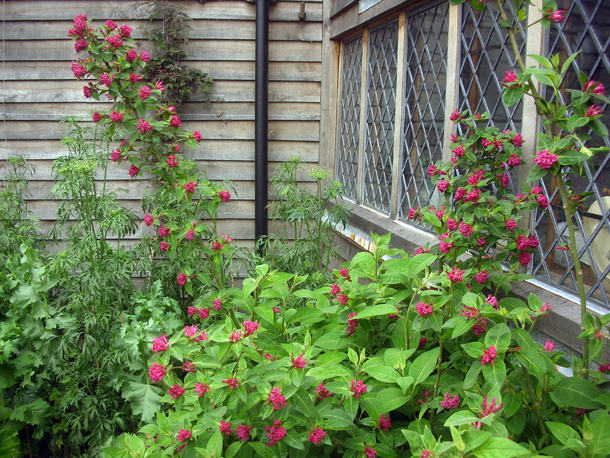 The tall dark red tree peonies - Paeonia delavayi, Euphorbia styrgiana that gave us a honey scent for so long. As well the quick succession of ladybird poppies - Papaver commutatum (the reddest I have seen of this cultivar) with the acid lime green of Euphorbia polychroma 'Major', and so much more. The tempo of the garden has gone up quite a few notches, so I have barely had time to even think about blogging. I will still be putting my month(s) old posts up though as I do have to do it as part of my scholarship, plus it's useful for me too and nice to share with others. But here is a special more current post in between. Me left, Makiko right. Photo courtesy of Perry Rodriguez. It's my birthday and I couldn't have asked for more - glorious weather and a juicy bit of planting, whilst eating peas straight from pods at lunchtime. 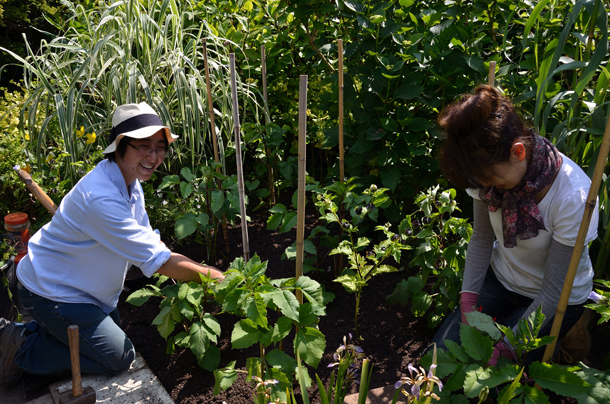 Here is me and Makiko (a freelance gardener designer from Japan who has come to volunteer for three weeks) tackling one of the patches of bedding that gets changed over once the spring interest has finished, ready for summer up to late autumn interest. 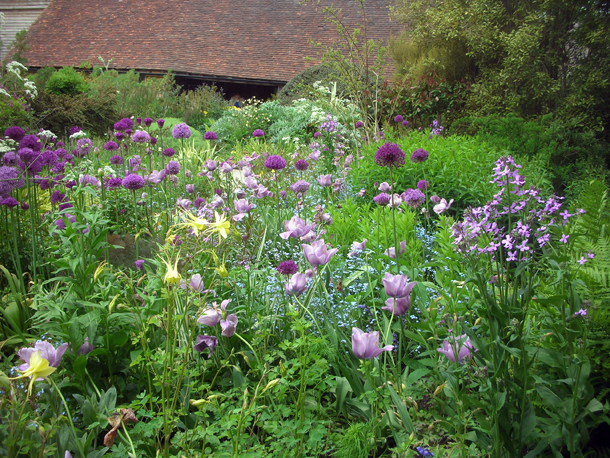 Here we had purple Hesperis matronalis & Tulipa 'Abu Hassan'. We are changing it over with Dahlia 'Emory Paul' and Nicandra physaloides - the shoo-fly plant. The latter is used as a filler really until the dahlias get going. I can't find any written material about it but I heard it is good for warding off white flies. The rate of people coming through to experience & work in the garden has also increased and from this I have realised that demonstrating something as basic as planting is not so straightforward, especially if one does not have much practical experience, it can be a little bit of a shock. 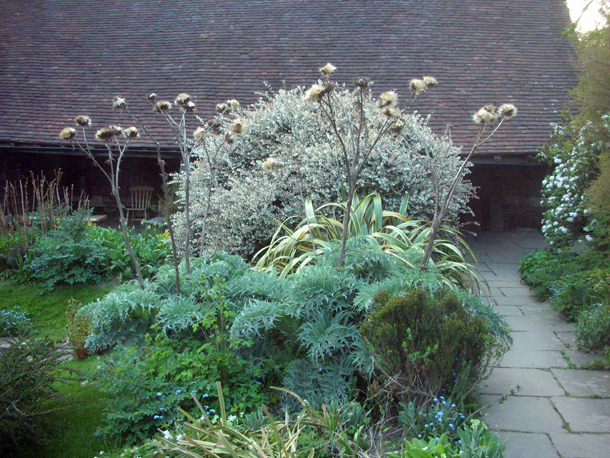 Dixter has such a particular but commonsensical way, from how the hole is dug, how a plant is staked to how it is watered. It's not a task you can just switch off to but involves a constant state of thinking (which is also why I love it). 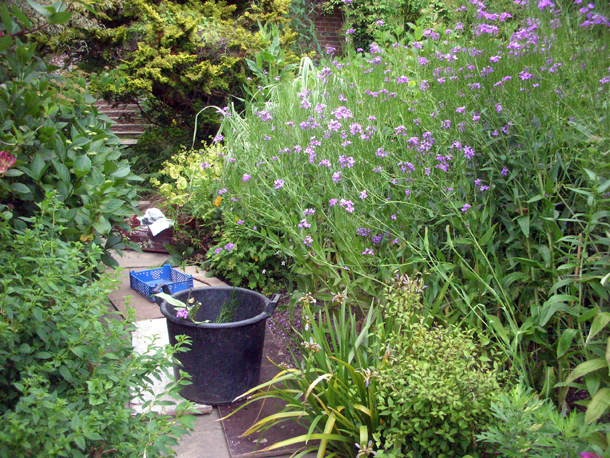 The more you practise these steps and have tuned into that intuition (how a plant should be placed, where its foliage is tending towards), it just flows as one long action, instead of lots of staccato bits, and it is pretty much foundational stuff that helps make you a great gardener. Makiko my lovely assistant did a sterling job and hopefully gained a deeper understanding of everything. We always lay out our planting to see what it's like before planting it in. We keep stepping back to see that the planting is still going ok. The shoo-fly plant being a filler is less priority than the dahlias, so these are planted and repositioned if necessary at the end. We have been planting up the Exotic Garden, so when I put these posts up I will briefly go over the whole process step by step that we go through when planting. Dahlia 'Emory Paul' which will be huge plants with dinner plate like flowers, are well staked to anticipated their growth.